No trip to another state is complete without checking to see if there is a Muffler Man in the vicinity. You can never be sure if you’ll pass that way again, so stopping is a must! On our recent trip to Birmingham, Alabama it was no different. 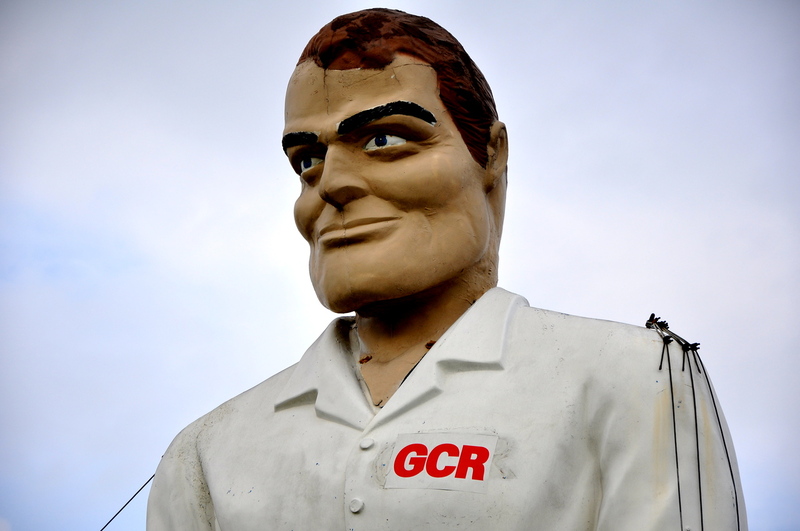 We stopped in to see “Stan” the GCR Muffler Man. With the fiberglass giants getting up there in age, they often need some upkeep and repair. They also get customized and personalized. Many of them have unique features like chest hair, eyelashes and in blue-eyed Stan’s case, white gloves. Stan underwent some major surgery in 1998 after a storm did a number on him. Hey -you can view some more of the big fellas we’ve visited in the Muffler Man Gallery. Where’s my lawyer, I’m suing!! that would be a pretty long ride for a night-time triple decker! Haha i was thinking the same thing as soon as i saw GCR You need to road trip out and eat a triple decker at his feet.